Winter getaways have endless potential for thrilling outdoor adventures! If you’re visiting Yosemite National Park this winter season, you’ll find a plethora of winter sports to enjoy. Downhill skiing in Yosemite is the ideal rush for those looking for some adrenaline-filled activity, while snow tubing is the perfect choice for families who need an activity that visitors of all ages can try. If you simply adore exploring the winter wonders of Yosemite National Park on foot, you need to try snowshoeing in Yosemite. Take a look at some of the best places for this activity and add it to your winter vacation itinerary today. This is the home of all of Yosemite’s best winter activities! At the Yosemite Ski and Snowboard Area, you’ll find trails for snowshoeing and cross-country skiing as well as slopes for downhill skiing and snow tubing. This part of the park also includes places to eat and picnic. This trail is an excellent choice for those looking for the best spots for snowshoeing in Yosemite National Park. A course that is roughly 8 miles in length round trip, Dewey Point offers incredible views of El Capitan and the rest of the Yosemite Valley. This trail isn’t particularly steep or difficult, but it is long, so pace yourself accordingly. Dewey Point connects to Crocker and Stanford Points as well, which you can try if you feel up to the challenge! Another great option for scenic snowshoeing in Yosemite is the giant sequoia groves. The Merced Grove is filled with wide, smooth trails and towering trees, creating the perfect backdrop for snowshoeing. Tuolumne is also a good spot; the path is short and smooth with wonderful views. During the winter in Yosemite National Park, the road that stretches from Badger Pass to Glacier Point is closed to all vehicles. This means that snowshoers can take advantage of these ten miles of quiet road and snowshoe through this scenic area. Be sure to check their website to see when this road is closed to cars and open for snowshoeing. 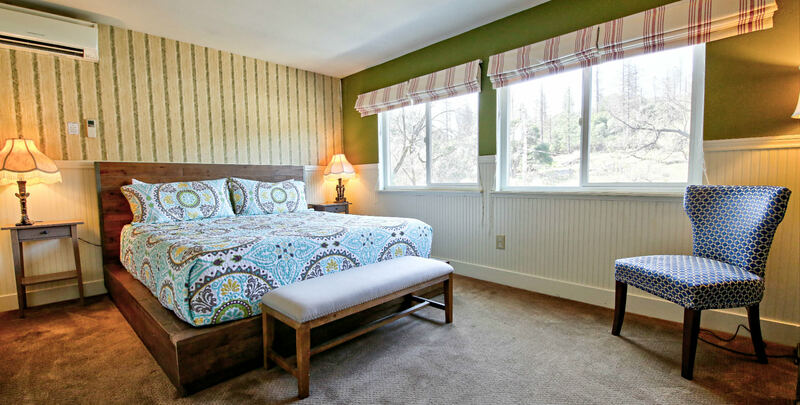 Come Stay With Us at the Hotel Charlotte near Yosemite National Park! After an exciting day of snowshoeing in Yosemite, you’ll want to unwind in the warmest and most comfortable accommodations! Hotel Charlotte is a historic bed and breakfast in Groveland, California, that offers luxurious lodging and amazing amenities. Choose from staying in one of our twelve lovely rooms or renting one of our cozy apartment rentals. You can explore the many attractions of our surrounding town of Groveland, adventure through the magnificent Yosemite National Park, or simply spend time in our peaceful environment; we have a beautiful living room, friendly and helpful staff, and even our very own restaurant to accommodate all of your needs! Don’t wait another minute to start planning your dream vacation; check our availability and book your stay today! To learn more about the many things to do in Yosemite, like snowshoeing in Yosemite, download our free Vacation Guide!